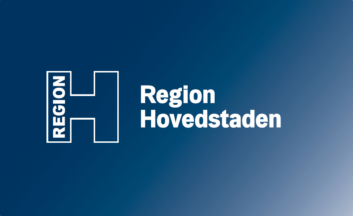 Hovedstaden Region was established through Kommunalreformen (English: Local government Reform (of 2007) (https://da.wikipedia.org/wiki/Strukturreformen) on January 1, 2007. Region Midtjylland includes the former Ringkjøbing and Aarhus Counties (with the exception of part of the municipality of Mariager), as well as the southeastern part of Viborg and the former municipalities of Brædstrup, Gedved, Hedensted, Horsens, Juelsminde, Nørre-Snede and Tørring-Uldum in Vejle County, evolving from most of the territory previously known as Viborg Amt (English: Viborg County). 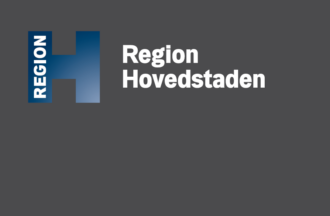 Hovedstaden Region flag is the logo (https://upload.wikimedia.org/wikipedia/commons/3/35/Danish_Region_hovedstaden_logo.svg) over a blue horizontal background. I am skeptical of these flags. I found two design manuals with two different versions of these flags, but unfortunately no photos on the web. So, here are the images of these flags..
From my own observations the Danes have their "sacred flag", the Dannebrog, which is often the only one hoisted in subdivisions. I have seen only a few commune flags in the past. Many communes have been merged during the last years, no matter whether their had been historical connections.